FDL Front Drag kits are drag racing�s most popular front brake kits. FDL kits are available for the popular muscle car spindles and select aftermarket front struts used on four-wheel disc cars weighing up to 2꼀 pounds, or rear drum brake equipped cars weighing up to 2군 pounds. Forged billet FDL four piston calipers mount directly to the spindle with a bolt-on bracket. Forged billet, five lug hubs with direct mount steel rotors combine to provide an average weight savings of over 30 pounds compared to stock drum or disc brakes. 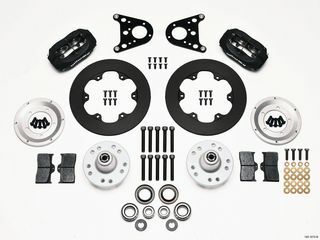 Kits include all new hardware, wheel bearings, seals and extra length lug studs.